I would like to share a card with you I made for Whimsie Doodles as their November Guest Artist. 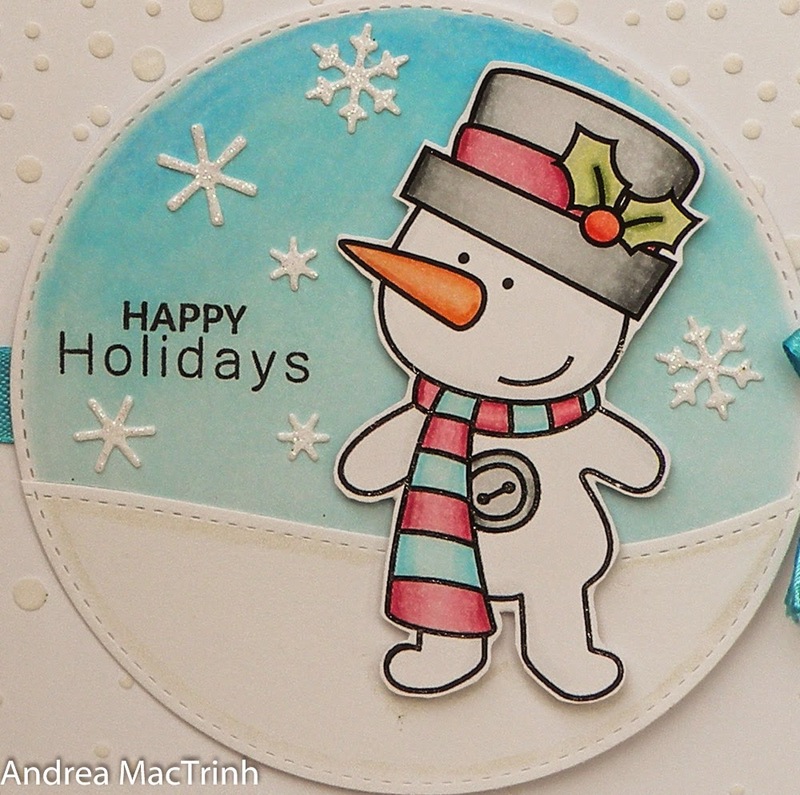 This cute little guy is called Snowbuddy and is part of the Santa and Friends Collection. I decided to move away from the more traditional red and green Christmas colours and went for some pink and light blue instead - I think he, or maybe it should be a she....suits it! 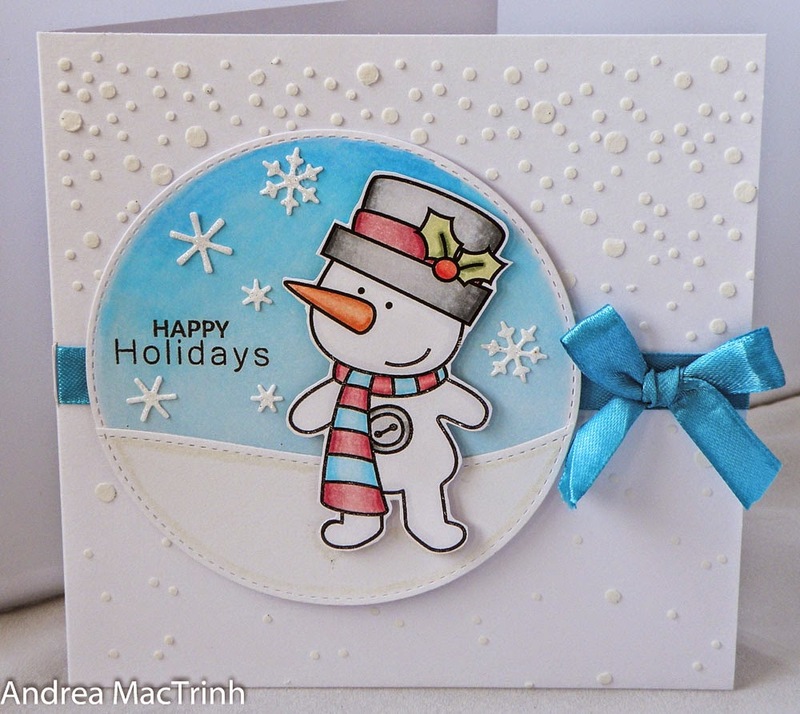 For the card base I used my newly purchased Simon Says Falling Snow stencil and some embossing Paste. I love how it came out! - this stencil is going to get alot of use. I coloured the die-cut background with my copics and added glitter snowflakes. The 'snow' is outlined with Wink of Stella White Glitter pen - in the photo it just looks like a white line, but I promise you in real life it actually looks glittery! I can't seem to make a card without adding at least one form of glitter! Don't forget to enter Whimsie Doodles Monthly Challenge with your Christmas makes for a change to win some cute digi's. The theme is Merry and Bright. Please come back later today for another round of Whimsie Doodles Cuteness. Thanks for looking, hope to see you soon. It's a lovely card with a lovely color theme. Thank you for joining us at ATSM. I do like the soft colours and pretty sparkle on the snowflakes. I love the texture from the embossing paste too. Great card. Thanks so much for playing along with ASM this week! Soooo cute - great colors, too! Love that embossing paste! Thanks for playing with us at ATSM this week! This is adorable!!! Love how the embossing paste worked on your background. That little snowman is so cute!!! Thanks for playing with CSAYL.